St. Olaf College in Northfield, Minn., has moved closer to concluding that a painting in its collection is the work of famed Norwegian artist Edvard Munch. The painting, the unfinished portrait of violinist Eva Mudocci, was donated to the college in 1999 by the estate of Richard Tetlie, an alumnus and art collector. It hung for years in the college president's house and was rumored to be a work of Munch. After documentary evidence surfaced to support the possibility, St. Olaf last fall arranged for experts from the Scientific Analysis of Fine Arts to study samples from the painting. "That scientific study did result in an increased likelihood that it is a Munch," said Sara Thatcher, who handles media inquiries for the college. Pigments used in the painting were found to be consistent with the artist's era and style. Munch, the Norwegian expressionist, is best known for his painting "The Scream," a version of which sold recently for a reported $120 million. Much of his work deals with themes of anguish or fear. By contrast, "Eva," as it is called on campus, is a somber but relatively sedate portrait of a woman standing alone. Roughly a quarter of the canvas remains unpainted with details rendered only in outline. For the next step in the authentication process, Jane Becker Nelson, director of the college's Flaten Art Museum, will visit the Munch Museum of Art in Oslo, Norway. 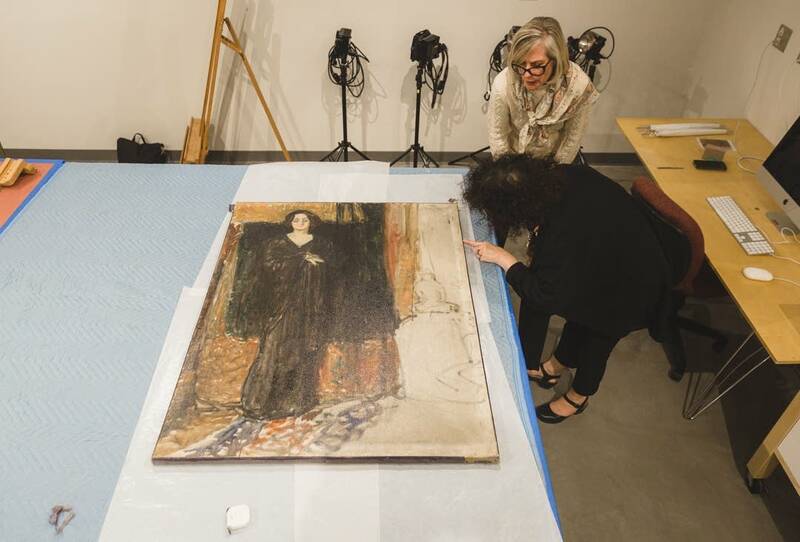 A decision by the museum's Munch scholars could be the final step in adding "Eva" to the body of the artist's acknowledged work.